I think you may be right, I'll have to think about that. In this specific case however, it doesn't matter. John Tromp's calculation was based on the fact that you can construct a position so that the game becomes 1 dimensional, where the points along the dimension can de filled a a systematic way to get 10^48 moves, and where you can play them in any order. 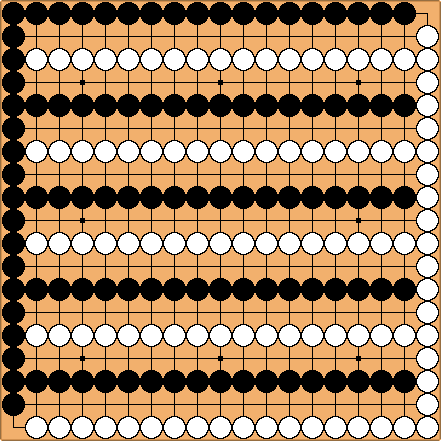 Where there are 103 black and 103 white stones that are fully connected, as well as 155 empty points, all of which are adjacent to both the black and the white group. Tromp's proof involves the fact that you can fill the empty points with one color (while the other player passes) except for one, then the other player captures, and then you rebuild the position in many different ways, with the one extra stone in place, and then repeat. He further proved that you can then cycle through all the possible fillings of the empty points as a Gray code, and since you can number the points in any order, he proved a lower bound of (103! )^(2^154) on the number of games from that. For details, see section 6.4 (p31 and further) in his paper.